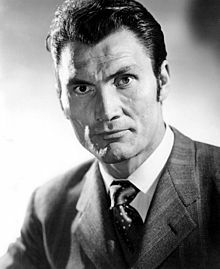 Jack Palance (born Volodymyr Palahniuk, February 18, 1919 - November 10, 2006) was an American actor. He won an Academy Award for his role in the comedy movie City Slickers (1991). Palance was born in Pennsylvania. His parents were Ukrainian immigrants. Palance began his career by participating in supporting roles in movies like Panic in the Streets (1950), Sudden Fear (1952), Second Chance (1953). One of his most memorable roles was that of gunman Jack Wilson, in the classic western Shane (1953), with Alan Ladd. His first important lead role was in the (1956) Robert Aldrich war movie, Attack as Lt. Joe Costa. In 1957, he starred in the western The Lonely Man, with Anthony Perkins. And also star works on some classics including Ten Seconds to Hell (1958), by Robert Aldrich, The Barbarians (1960), Barrabas (1961), The Professionals (1966). He played the role of Fidel Castro, in the movie Che! (1969), with Omar Sharif as Che Guevara. Another role was Capt. Quincey Whitmore, in Chato's Land (1972), with Charles Bronson and directed by Michael Winner. 1970 was working in Europe and participated in some spaghetti western films and some crime and gangster roles. Palance starred in several horror movies includine Torture Garden (1967), and Craze (1974) by Freddie Francis. The Strange Case of Dr. Jekyll and Mr. Hyde TV (1967), He played the role of Dracula in the TV movie Dracula by Dan Curtis, Alone in the Dark (1982). By late 1980s he acted in major productions such as Young Guns (1988), Batman (1989), play role of Carl Grissom, Tango & Cash (1989). Palance won an Academy Award for his role as Curly Washburn, in the comedy movie City Slickers (1991). He had a long career in television. He starred in the series The Greatest Show on Earth (1962), as Johnny Slate, and played the role of Lt. Alex Bronkov in the crime series Bronk (1975-1976). He was the host of the popular show Ripley's Believe It or Not! (1982-1986). As special guest star in Playhouse 90, The Man from U.N.C.L.E., Convoy, Buck Rogers in the 25th Century. This page was last changed on 12 September 2014, at 22:49.